Recycling has been mandatory in New Jersey since 1987. One might be tempted to say, “No one has forced us to recycle yet. Why worry now?” The simple answer is because the reasons for the mandate have not abated. New Jersey still faces the prospect of rapidly rising disposal costs and diminishing landfill space. Thus, state and local governments’ resolve to increase recycling rates (the legislature raised the state’s recycling goal to 60%) continues to mount. In fact, this manual may have arrived from your local officials along with a notice to begin recycling – now! School recycling programs require special planning and careful implementation if they are to become a lasting part of a student’s educational experience. 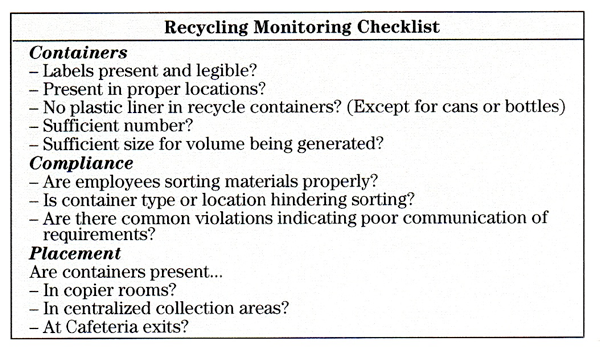 This manual will guide key school personnel step by step through the process of setting up a recycling program. It provides all the necessary tools for designing and implementing a viable and comprehensive program in public, parochial and independent schools. The Association of New Jersey Recyclers greatly appreciates the permission granted by “Recycle More Minnesota” to incorporate many of their valuable schools recycling materials, videos and guidance documents. If you are ready to start a recycling program or improve your existing program, we recommend the following steps and resources. Come back to this page regularly to check your progress and download resources. Recycling is good business for schools. Our throw-away society has created major solid waste issues. In many parts of the United States, landfills have reached their capacity and have been closed. States that once accepted waste from other states have now closed their borders to those imports or have imposed steep fees. The Northeast was one of the first regions to feel the impact of surging disposal costs and diminishing landfill capacity. In New Jersey and New York, disposal costs have skyrocketed over 300% since the year 2000. While establishing recycling in the business and school sectors initially was viewed as just one more burden of regulatory compliance, in fact such programs can be easily implemented and can yield cost savings. 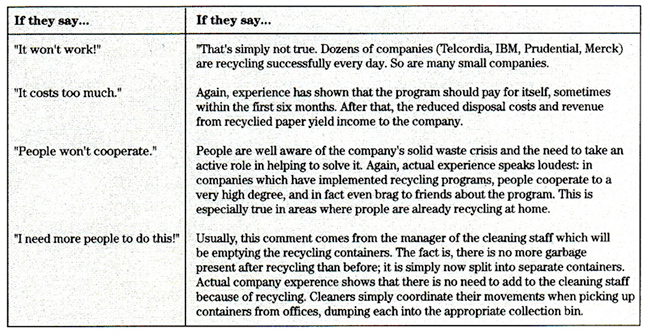 Less definable, but no less real, is the positive employee and student feedback and pride that can be generated when recycling programs succeed. The steps, recommendations and examples in this website are derived from recycling programs that have been highly successful and have generated savings. You don’t have to reinvent the wheel! There is no single “best” approach to capturing recyclables from your school’s waste stream. A variety of methods have succeeded and are described with examples in the DESIGN YOUR RECYCLING PROGRAM section. The overarching goal, however, must be to make it easy for employees and students to recycle. The more sorting, decision-making or inconvenience an individual must go through, the less successful the program will be. Recycling must easily blend in with other daily responsibilities, and should not be viewed as a chore that is to be done only if time or convenience permit. Besides “being easy to participate”, all successful school recycling programs share another common denominator: effective, upbeat “selling” of the program to everyone in the school. The best program in the world will fail unless the enthusiastic cooperation and support of all those in the school can be enlisted. In the KICK OFF AND EDUCATE OTHERS ABOUT THE PROGRAM section, you will find a variety of sample publicity materials from successful programs. This website has been laid out generally in the chronological order that those responsible for implementing or upgrading a school recycling program would follow. It is suggested that the key individual responsible for leading the effort take the time to carefully go through this entire site in order to become familiar with the contents and available resources. A number of graphic and video examples have been provided as well. There are also many forms, links, publicity samples and other resources which you are invited to use or tweak for your own school. (3) your enthusiasm for the project. Who is the best candidate to lead the development of a school recycling program? There are many candidates, including a principal, a business manager, or a teacher. Even though a successful program requires multifaceted participation, one individual should be designated as the program’s central coordinator. It is vital for the coordinator to know the schools well. The central coordinator can review the entire manual and then revisit the relevant sections as each phase of the program’s development is reached. 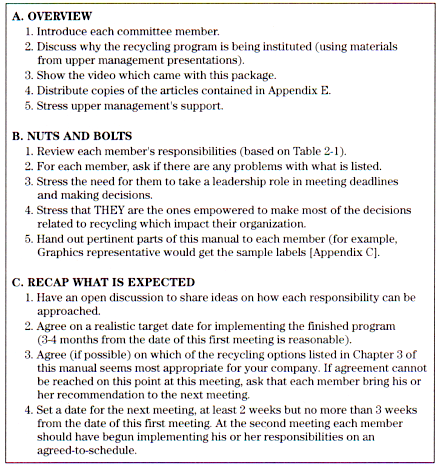 Refer to the section entitled “Key Steps to Establishing a Recycling Program” for a quick overview of the phases of program development and management. Hot tips for implementing your program are found throughout the manual. School representatives responsible for certain aspects of the program’s implementation will find “lift-out” sections pertaining to their specific responsibilities. By working together, the central coordinator and other key personnel can guide the school successfully through all phases of program development. As the program takes shape, don’t forget to leave room for student involvement. Students are imaginative and creative. Their ideas and energy can fuel the school recycling program from start to finish. When you have the support of the school’s managers, you can form a recycling team. Your recycling team is a small group of people who will collect data, design the recycling program, and teach students and staff how the new system works. Within this team you’ll need to identify a champion. This person facilitates the entire process and communicates progress and challenges to the decision-makers. This person must have the authority of the principal or superintendent to advance the project. Below is a list of people to invite. Aim for a team of at least 4-5 people, including a custodial or kitchen staff person. Nevertheless try to keep the number of people involved in the planning to as few as practical, while still representing each key stakeholder that has a specific role. Very important : Obtain top leadership support for the program before beginning. This support can be subsequently mentioned whenever a bureaucratic roadblock or potentially missed deadline occurs. As with any large project that seeks to initiate or improve behavior, there may be some individuals who will attempt to set a negative tone by saying things like “it won’t work,” “it costs too much,”“people won’t cooperate,” or “I need more staff to do this.” None of these statements is true, based on the actual experiences of schools with successful recycling programs. If possible, these “nay sayers” should be kept off your committee and out of any active decision-making role. Let’s go step by step through the elements of getting your program started. It can be done with relative ease and has already been done at other NJ schools, many of whom have won recognition for their programs. Other civic groups and environmental organizations want the school to recycle successfully. During your presentation, be sure that your enthusiasm and confidence in the project shows. That can help sell your project to top school management as much as statistics and bottom line projections. Also, be prepared to offer suggestion on whom you would like on your committee. Prior to the presentation, make up your “wish list” of individuals from your school’s procurement, maintenance, janitorial, food services and other internal groups whom you think could inject enthusiasm and support into the program. While all of your suggestions may not be accepted, it’s better to come prepared with some names rather than try to think of potential committee members on the spur of the moment. All schools, (public, private, and independent) are required to separate and recycle the materials that their counties have designated.. Although each county can devise a unique plan, all have designated paper, cardboard, bottles and cans as mandatory recyclables. The full table of designated mandatory recyclables in all counties can be found at http://www.nj.gov/dep/dshw/recycling/design_recy_county.pdf . The New jersey Department of Environmental Protection promulgated regulations at NJAC 7:26A-10 and 11 to clarify the requirements of generators (people who use materials that then must be recycled) and municipalities. The regulations can be found at http://www.nj.gov/dep/dshw/recycling/rule_link.htm . Each municipality is required to appoint a recycling coordinator to educate the public, report recycling tonnage, and assure that every generator can obtain recycling services. Each town also must appoint staff to enforce the municipal recycling ordinances. While many towns don’t rigorously enforce against their own schools, this does not exempt the schools from recycling. Schools may be inspected by county agents as well, and issued warnings and penalties if they persist in disposing of designated recyclables. County penalties begin at $3000. When establishing a recycling collection program at your school, you must remember to adjust your trash removal contract. A waste audit will help determine how much current waste will be diverted to the recycling collection, and will support the reduction in your trash removal contract. What if your town picks up your trash at no cost? This lifts the cost burden and deprives the school of motivation. In that case, the town’s director of public works should be making the argument that the school is passing a needless cost to the town’s taxpayers. The town should be ready to help the school improve, and to share cost savings that the school can achieve. Speak with the municipal governing body, environmental commissions, your PTO to request support for the recycling program. If your municipality collects your recyclables or trash, they will have an economic interest in your success. School managers may feel more assured about starting a new program if it is clear that the larger community values it. Review the table below, which suggests some of the school organizations essential to your committee. For each organization, we have listed a set of key responsibilities. When selecting committee members or suggesting names to senior school management of that group, consider how well your selection will be able to deliver on each of the responsibilities. Persons serving on the committee should also participate with the understanding that the have the authority to make most necessary decisions. A committee member who must run back to his or her manager on every decision is definitely the wrong choice. If possible, discuss these parameters with the appropriate manager of each organization which is contributing a committee member. Once all of the committee members have been selected, schedule your first meeting at a time when everyone is available to attend. While any subsequently missed meetings can be re-capped by phone or email, it is important that every member attend the first meeting. It is here that you will outline goals, generate enthusiasm and support, and begin to assign responsibilities and deadlines. During the meeting, be alert for any individuals who may appear unable to meet their portions of their implementation responsibilities. A separate one-on-one meeting with such an individual may be in order. Because all of the responsibilities are critical, and interlock into the whole that will form the finished school recycling program, you cannot afford to rely on someone who will be unable to complete action items on schedule. It is therefore better at this earl stage to select a more appropriate substitute or at least share your concerns with the individual, or his or her manager. The next several months will involve the actual mechanics of purchasing materials, writing or adjusting contracts, preparing publicity materials, and following-up to keep everything on schedule. Subsequent sections detail ideas on how to fulfill these and other requirements. Weekly committee meetings are likely excessive and progress will be better served if the chairman follows up directly with the individual committee members on action items as they approach their deadlines. It should only be necessary to get the committee together on a monthly basis. That meeting will serve to get the entire committee up to speed as to how the entire school project is progressing. Each member should report on the status of each element of his or her list of action items, and any problems or delays that have been encountered. Conduct a building walk-through. A building walk-through can help identify types of materials to target for reduction and recycling and is done to help you anticipate your needs. You’ll record information about where waste is produced, where the bins are, and how many bins are in use. Use the data collection sheet below for your building walk-through. Start tracking the weight or volume of your garbage and recycling. You can learn about your current waste amounts through records or by directly looking at, weighing, or measuring the trash. Choose one of the suggested formats and data collection sheets, linked below. Another data tracking option: Your school may also be able to track waste and recycling costs through data management systems such as TIES, the Uniform Financial Accounting and Financial System (UFARS), or through your waste and recycling hauler(s). If your school uses these systems, investigate their ability to track waste data, too. And last, a student involvement option: Project Learning Tree has an investigation activity that students can complete and present to the principal or school board. At the same time that you are doing the prior step, you can start learning about your current waste contract. As you reduce waste and increase recycling you’ll need to “right-size” your dumpsters and collection frequency. Often, this “right-sizing” process is where districts can see substantial savings. 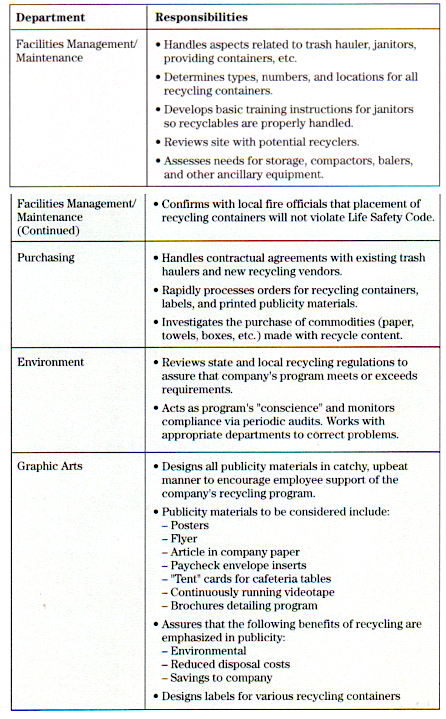 Your waste contract will influence this process, so it is best to learn as much as possible about the contract. Under most circumstances, there should be no need to re-negotiate you contract with the school’s existing waste hauler. The hauler will still be removing the school’s trash — just less of it. If a fixed price was established annually regardless of the amount of trash generated, then that definitely needs to be re-negotiated to a lower price or a “per pull” charge. During this contract review process, you will also need to select a vendor to take the school’s recyclables. The best choice is often NOT the same vendor that takes your trash. Work with your school procurement or business official, head custodian, and administration to review the existing contract. Use the questions listed below to review your contract. If your feel like you do not have very many recycling options, contact a staff person from the county solid waste office for help (find that person here). Between the data you collected for the previous step, the options available in your county according to your county solid waste office, and options available from your hauler, your team can discuss the types of material you want to collect for recycling. If your waste contract needs to change, you will need to negotiate with your hauler. How often is trash and recycling currently picked up? Are your dumpsters full when they are picked up? What kinds of recycling materials are being picked up? What kinds of recycling materials would you like to be picked up? Can you negotiate changes, if needed, without penalty? Can your hauler provide any data about what they pick up at your sites (e.g. weights)? What are the recyclables the vendor will take? Do you get paid for any recyclables, and if so is that payment tied to a published value? Does the vendor provide the school with a minimum “floor” payment for recyclables, below which your payment cannot go (including a negative number that you could be charged)? Does the vendor take all the recyclables that the school generates in significant quantities? Can the vendor provide at least three reference that you can contact related to the quality of their services? For some schools, a Resource Management Contract may be something to discuss with the hauler. A Resource Management Contract places value on resource conservation services rather than on disposal volume. For more information about this type of contract, contact your county solid waste officeor Association of New Jersey Recyclers. Download Resource Management RFP (“request for proposal”) and Contract templates from MPCA’s Resource Management Programs page. It’s finally time to design your recycling program! At this stage you should know what you plan to collect. Cardboard, mixed paper, bottles, cans and food waste are common items to collect in schools. Your plan will depend on your unique location and circumstances. 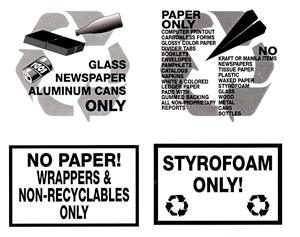 Here are some sample ideas for effective recycling bin labels. Your local printer should be able to customize these to meet your school’s requirements. Add more collection bins at points-of-generation, such as paper binds at every copier, beverage bins by vending machines and in cafeterias. In some cases, your recycler may provide all of the necessary recyclable collection bins at no cost, as an entree into getting the contract with the school. This option should at least be pursued with potential recyclers. You should also assess if your school generates a sufficient amount of cardboard to warrant the installation of a min-compactor or baler. Cardboard (aka “corrugated”) frequently has high value and therefore should not be dismissed as one of the commodities that are recycled at your school. 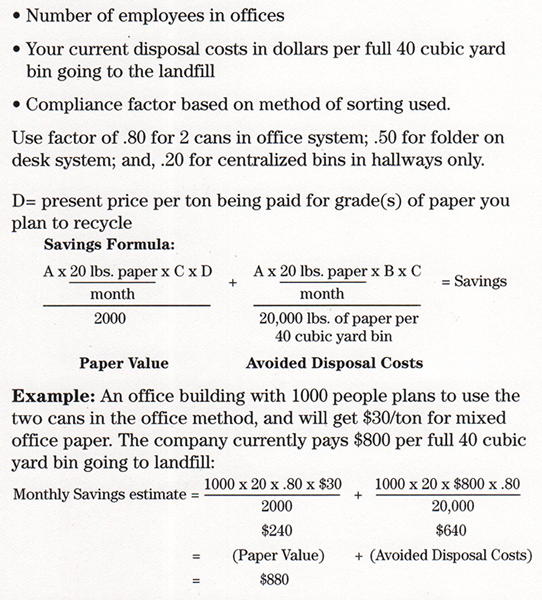 Discuss this with your potential recycling vendors, along with any costs related to a baler or compactor. At this time, the question of budget often comes up. The direct costs associated with a recycling program should have a short payback time. The greatest one-time capital cost for a district recycling effort will probably be the acquisition of containers for collection of recyclable materials. The savings will come when you “right-size” your collection containers and pick-up frequency. Second, design the logistics. Who will handle your recyclables? How often will bins be emptied? Where will recyclables be stored? Are there opportunities to involve students in the process? How will you monitor your progress? Use the recycling plan template, below, to step you through the process. Last, set a goal. Compared to your baseline, do you want to increase the recycling rate by 20%? Decrease trash volume by 30%? Reaching this goal will depend on education and expectations for participation. 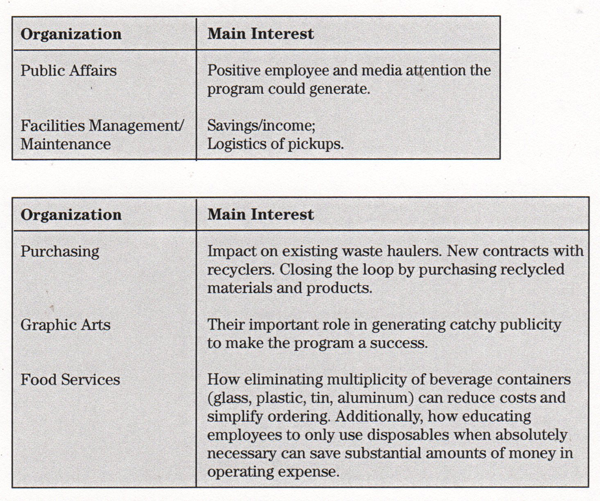 The Recycling Plan template below will guide you through some of these considerations. Make one complete recycling and trash station. Co-locate recycling bins next to trash cans. Provide several students and employees with a bag of recyclables to sort. Watch for assumptions, questions, and difficulties they may have. Invite them to give you feed back. Make improvements based on the experience. Make final decisions about bins and signs. Download free standardized recycling labels from the Recycling Association of Minnesota. Contact your local county solid waste office for labels specific to your county. Hennepin Countyhas some good examples. Contact your hauler. They may have signs, or may be willing to help you purchase some. Have students make posters to post above bins in key locations. Be sure the posters are consistent with the labels on each bin. Make your own labels. Clip art for labels can be downloaded from the RMM Media Toolkit. Contact your local county solid waste office to see if they have a recycling bin program or know of a recycling bin program you can participate in. Ask your recycling hauler if they provide bins or grants. Talk to your bottling and soft drink beverage vendor to see if they will provide collection bins or boxes as part of the contract to sell their products in your facilities. Apply for the Coca-Cola Company and Keep America Beautiful bin grant program. Become a member of the state’s Cooperative Purchasing Venture, where you can purchase containers at a bulk rate and save money. The Recycling Association of Minnesota (RAM) sells bottle-shaped bins. RAM does ask that you make a minimum order of 10 bottles, due to shipping costs. If money is tight, sturdy cardboard boxes can serve as free alternatives. Design and build your own containers as class projects. Ask a local business or service club to donate the materials (or bins) to the school district. A quarter of the waste produced at a school, by weight, is food waste — and a whopping 50% of the waste produced at a school is compostable! This sizable portion of the waste stream deserves special consideration. Talk with your county recycling coordinator to learn about options for food-to-livestock and composting programs in your area. Convert to all aluminum cans if possible. 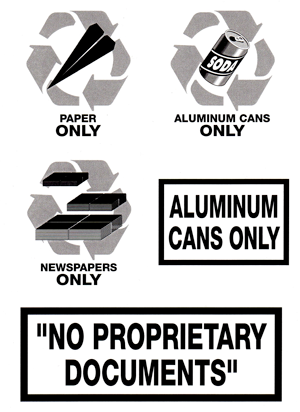 Aluminum is more readily recyclable than glass or plastic containers, and has high value. Install a clearly labeled bin near the vending machines to help capture beverage containers near the source. If you have plastic/glass/aluminum containers being generated, only one bin to collect all these commingled should be necessary. If practical, discontinue use of disposable plates, cups and utensils. Convert to washable dishware and utensils. This will also likely be cheaper in the long run. Encourage teachers and administrator to stop using disposable paper or Styrofoam cups and instead convert them to re-usable mugs (perhaps with your recycling logo). Eliminate the use of bottled water, and instead convert to jug-type dispensers. The cost should be less, and you will be eliminated the disposal f thousands of plastic bottles each year. Avoid the Styrofoam vs paper cup debate. Neither is better than the other, and neither decomposes in a landfill over centuries. The best choice is a reusable mug! Tell people what to recycle, how, and where! Set expectations that everyone participates, including supervisors, staff, coaches, and students. If custodial staff were not a part of your recycling team, take extra time to educate them about the new system. When you design your recycling program, make sure you have a plan to track your progress. Measure how the total trash and recycling volumes/weights are changing. Make observations about contamination and problem areas. Regular monitoring of the metrics of your program (number of pickups, weights of recyclables, savings, etc.) will help assure you that the program is maintaining a high level of compliance. Monthly figures on how many pounds or tons of recyclable material has been collected will be sent to you by your recycling vendor. They will also send you any required payments if that is part of your agreement. It is important that these metrics are funneled to you or your designated recycling coordinator for collection and subsequent reporting. If needed, improve your program by replacing bin signs, informally surveying program participants to understand existing issues, or moving/adding bins in problem areas. Also consider adding new commodities. Roofing shingles, old carpeting, wood wastes and fluorescent light bulbs are not wanted in the standard recycling bin, but that doesn’t mean they aren’t recyclable. Once your program is managing the common wastes typically generated every day by schools, you can seek opportunities to recycle unusual materials. Be sure to consider this when planning remodeling, school additions or lighting conversions. Also, commodities change over time. Right now, milk is least expensive for most districts in paper cartons, but plastic bottles may drop in price. When containers change, you need to find out whether they are recyclable. Markets change as well – your hauler may someday be able to market materials that are trash for now. Keep in touch and see what the company can do. Contact ANJR, or your municipal or county recycling coordinator for assistance. Notes to the town council and municipal environmental commission. Get a commitment. During your recycling program kick-off, provide a way for people to publically commit to recycling. Create a giant poster to sign. Take and post pictures of people with their reasons for recycling written on a white board. Give a prize or incentive to people who commit. Visit the Community-Based Social Marketing website for ideas and research on how to increase sustainable behavior. Adjusting your garbage collection process is an important part of your recycling program! If you can reduce the size of the dumpster you need, or the frequency of its pick-up, you will save money. How often are your trash dumpsters serviced? Are they full each time they are serviced? If not, ask your hauler to reduce the frequency of pickup OR to reduce the size of the dumpster(s), whichever will cut your costs most. Many schools have excess trash dumpster capacity and pay more for trash than they need to. How often are your recycling carts or dumpsters serviced? Are they full each time they are serviced? Are they ever full a day or two (or more) before they are serviced? If your recycling carts or dumpsters seem to fill up quickly, ask your hauler to increase the size or number of recycling carts or dumpsters or ask them to increase the frequency of pickup, whichever is cheaper for him. Many schools fill their recycling containers early in the week, leaving no room for the recyclables collected the rest of the week. Many districts request oversized containers so that, in the event of a big event or cleanout, they’ll have the space for the extra trash once or twice a year. But your outdoor containers should be sized to hold the normal load. You can add provisions to your contract for additional bins in June for clean-up, and for emergency pick-ups at a pre-determined cost in case you generate extra trash a few times a year. Schedule a meeting with the person who handles your garbage collection contract (this could be a representative from your school or a person at the school district). Bring along your waste and recycling tracking sheet and the ideas you have for changes to your school’s garbage collection. After you meet with your school’s contract representative, you’ll want to schedule a meeting with your waste and recycling hauler to request the service changes and receive a price estimate. Once your hauler makes the requested service changes, continue filling out your waste and recycling tracking sheets to ensure that the changes to the collection are meeting the needs of your school. The janitorial staff, whether employee or contracted, is a critical link between students, staff and the recycler. Failure to clearly instruct the janitors in their basic but essential duties can sabotage your recycling effort just as it gets started. During the week before the program’s kickoff, hold meetings with the entire site janitorial staff. If contracted, you should first meet with the contractor management to explain what will be expected of the janitors once the program begins. If there are any potential language problems, some arrangement should be made to ensure that your needs are clearly conveyed and understood. The contract should assist in this if necessary. Some schools and businesses have created a simple pictogram for janitors to understand their most basic responsibility: DO NOT MIX WASTE AND RECYCLABLES TOGETHER. Consider a card with one side showing a paper bin and trash bin being dumped into the same collection container. Place a large red circle with a line through it symbolic of “DO NOT”) over it. One the other side of the card, show the paper bin being emptied into a labeled paper collection container and, separately, the trash being empties into the correct trash collection container. As basic as this seems to be, intermixing of waste and recyclables after occupants have correctly separated them is the single most common problem encountered in schools and businesses beginning a recycling program. Remember that due to turnover, new janitors need to get this same basic training. Contracts should allow for adjustment of containers and collection schedules if the original volume estimates need adjusting. If local purchasing procedures don’t prevent it, it might be advantageous to solicit ideas on certain program design aspects (such as container needs) from vendors prior to writing an RFP. Their input may help to clarify certain objectives and raise other possibilities. When you’ve reached your goal — such as doubling your recycling rate or reducing your total waste by 20% — celebrate! Host an ice cream social or play music during passing time. Write up a one-page summary of your process and the results. Share this with the school administration, parents and community members. If you have suggestions for fun ways to celebrate recycling successes, please send your ideas to anjr@optimum.net. To ensure that a successful program continues for years down the road, your recycling team needs to help recycling become a part of the culture at your school. Unless the recyclables are in a marketable condition, the program will die in the school’s collection bins. The school must treat the recyclables as products, not just another form of trash. The key to quality control is regular monitoring of recyclables. In many schools, students enjoy carrying out this responsibility. Adults and students must know which papers and containers are acceptable to the hauler, and which are considered contaminants. Monitors should screen the recycling bins before collection day and either remove all contaminants or leave the recyclables behind with a notice stating why the bin is unacceptable. The monitors also should notify the Central Coordinator about continuing problems. A “Recyclables Not Acceptable” card can be created by the school, to be left behind whenever recyclables in a classroom, office or teachers’ lounge are unacceptable. Don’t underestimate the power of positive feedback – develop a thank you card to recognize good habits, or list good recyclers on the school website. When contamination occurs in materials generated in the cafeterias, kitchen workers should be notified to be more careful, and students should have the recycling message reinforced through loudspeaker announcements and onsite monitors. The team leader should visit each school periodically, not only to answer questions and to provide progress reports, but also to spot-check for contaminants. Even the most carefully planned and implemented program can fall apart if quality control is not maintained. Recycling programs are more likely to last if people feel pride in them. Publicizing the amount of material recycled or the high value of recyclables both within and outside the school community builds support. Consider public address announcements, certificates of achievement, photos in the school newsletter, a hall of fame. Notice in local newspapers and on local radio adds excitement. All key personnel will be devoting a great deal of time and energy to implementing and maintaining the new recycling program. Don’t forget to recognize each one. Superintendents and principals can recognize outstanding efforts, and anyone can offer encouragement or thanks at staff meetings. Try to be aware of special contributions to the recycling program, and be sure the people behind these contributions receive the recognition they deserve. The superintendent will need to be available a few times a year to discuss any difficulties with the team leader and head of custodial operations, to help find and authorize solutions. The business administrator will need to be available occasionally to discuss contractual issues with the hauler, and should review data from initial and routine waste audits to understand the management of materials generated in the school. Every few years the business administrator will need to develop new bid specs, taking into account the expertise of the recycling team. He may also be the one to send summaries of volumes or tons of materials recycled to the municipal recycling coordinator for use in the town’s tonnage report. Consider broader sustainability goals at your schools. Can you reduce your waste by preventing it? Is your school ready to tackle energy efficiency or indoor air quality? After a successful recycling program, staff and students may be interested in addressing additional projects. A good environmental project involves buying recycled products. The school or school district must make the decision to purchase recycled goods whenever possible. Product availability and pricing changes over the years, and many high quality products made from post-consumer materials are affordable. The easiest way to buy recycled is to participate in community and state organizations that have organized procurement programs. Add waste prevention and recycling to classroom activities. Let students lead the way through service learning projects that green the school campus. Minnesota has a wealth of education resources; a few are listed in the Resources section below. Schedule recess before lunch — the students waste less food! Curriculum and teaching resources: Recycle More Minnesota offers these resources to connect you with simple ideas and easy-to-understand materials, both to integrate recycling issues into your curriculum as well as to make recycling a habit in your classroom. “MyGarbology” (NatureBridge): An interactive online game that teaches about Garbology and answers the question, “Where should my waste go?” You’ll also find lessons and activities to extend your Garbology experience, from how to pack a waste-less lunch to getting the dirt on composting. “Recycling Starts With You” (Scholastic): Classroom materials on paper recycling for grades 3-6 in the content areas of math, science and language arts. “Wise About Waste” (Minnesota Children’s Museum): A curriculum designed to work towards meeting the Minnesota Academic Standards in the areas of science, art, language arts, social studies and math. Written for 3rd and 4th grade, but can be tailored to higher or lower grades. What’s Our Recycling Rate? What Does it Mean?